Fabulous Flowers: Bouquet #1 by Denise Bossarte is a book of photography that focuses on Bossarte's collection of floral images, shot herself and for universal public use. There is little in the way of pretext when this book is taken in hand; however, readers who enjoy sharing their personal collages, scrapbooks, SoulCollage® cards, or any other form of craft work can partake in Bossarte's generous contribution to the art without risk of copyright infringement. The photographs are well presented and thoughtfully displayed with a blank back-side to avoid having to choose between one flower or another. They are also beautiful in both angle and aspect, but it's truly the colors that steal the show here - vibrant, razor-sharp, and polished - and Bossarte arranges a total of sixty botanical beauties, thirty large and thirty small, for the artist in us all. While I have never personally created collages or made a scrapbook, I do have the most wonderful memories of making little laminated boxes with my mother, using the traditional art of Victorian decoupage. We'd scour magazines for hours, hunting down glossy photographs, meticulously cutting them out and fixing them to box blanks before laminating them. 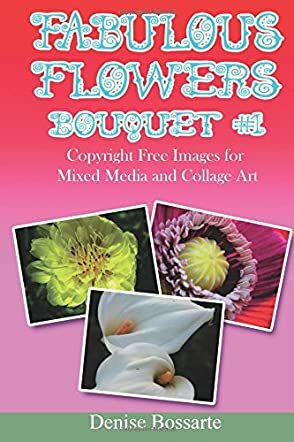 Had a book such as Fabulous Flowers: Bouquet #1 by Denise Bossarte been available at that time, I'm certain it would have been a welcome, worry-free asset to the craft. It's a beautiful collection and I would very highly recommend this book to anyone who uses floral photography in any art form.